With Focused Solutions SAP provides a new add-on concept for SAP Solution Manager. The Focused Build Solution is designed to provide a ready-to-run process for agile projects. Besides that, further solutions and features, so-called Standalone Enhancements, can be applied to improve your Solution Manager experience. In this blog post, I will describe the standalone enhancement Focused Build – Test Steps in more detail. With Test Steps a completely new way of manual testing with SAP Solution Manager is introduced. It covers all activities from Test Case Design to Test Execution and Test Reporting. Modern Fiori applications for Test Engineers and Testers enable a state-of-the-art user experience. The deep integration into Solution Documentation and Process Management significantly accelerates test case design. Creating and executing a manual test case has never been easier! With standard SAP Solution Manager manual testing is based on documents created in Word or Excel. Creating and executing a manual test case with office applications is done quite fast since test engineers and testers are used to work with those applications. In addition, many companies have predefined templates which can be used right away. So why do we need yet another manual test case type? Everything done in a document, stays in the document. We cannot aid users during design or execution of a test case. We cannot control the content quality. We cannot provide any reporting or analysis of the content. We cannot … I think you got it. The content of the document cannot be integrated with the content of Solution Manager. After investing so much time into preparation of managed systems, process documentation, or even business partner master data, you have no chance to reuse and link any of those smoothly into your test documents – neither for test engineers during creation, nor for testers during execution. Understanding the need of an alternative for document-based test cases, I will compare both types in the following. As a best practice the starting point for manual test cases is Solution Documentation (SolDoc). Document based test cases can be uploaded or created within SolDoc using, e.g., Word or Excel files. 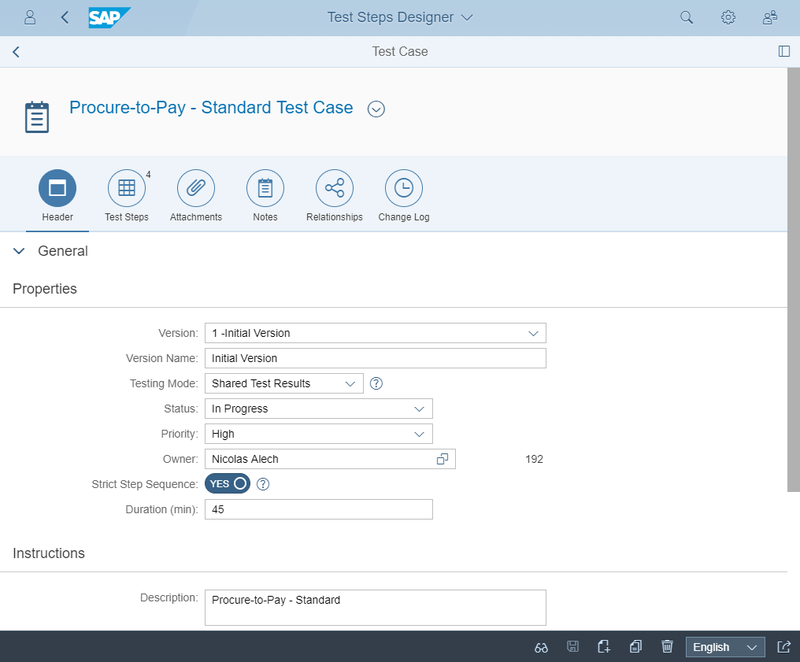 To create Test Steps test cases, you navigate to the Fiori application Test Steps Designer and describe the steps to be executed directly in the application. Having prepared all relevant test cases, you go over to Test Plan Management, create Test Plans as well as Test Packages and assign testers. This holds for both types of test cases and you can also use both within the very same Test Plan or Test Package. When it comes to the execution of a document-based test case, testers find the test document via the standard tester worklist. To document the test results, they create another file, the so-called test note. 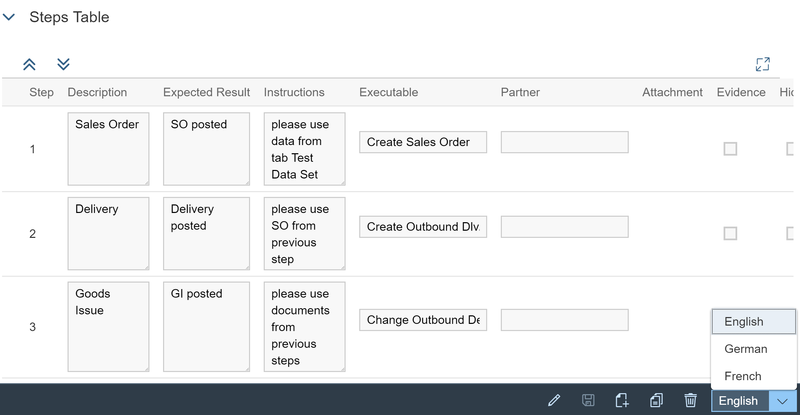 Test Steps are executed in a separate Fiori application: My Test Executions. where testers find all manual test cases which are assigned to them (both types are supported). Testers are guided during the execution and they document the results directly in the application. Test reporting for document-based test cases can be done via standard Test Suite Reporting and Analytics capabilities. While this covers the overall results of manual test cases incl. Test Steps, an in-depth reporting on step level is available only via the dedicated Focused Build Test Suite Dashboard. Below I will give an overview on the applications and main features of Test Steps in the different test phases. 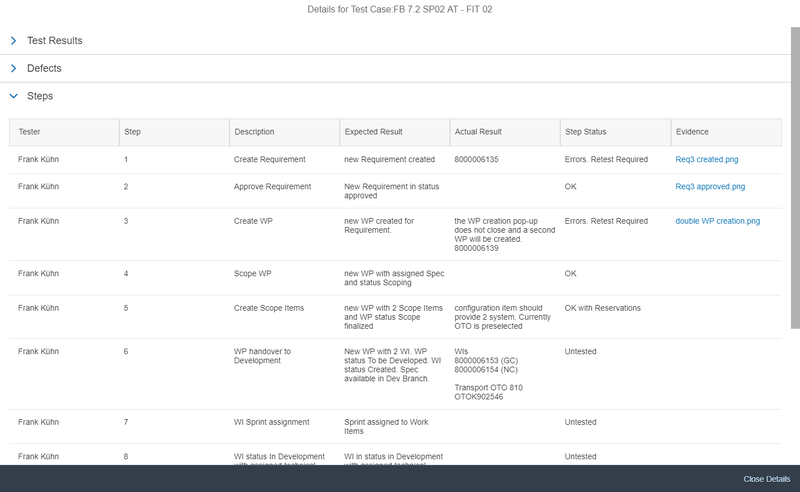 To create a new test case, you can start in Fiori Launchpad or via Solution Documentation. Starting in SolDoc, you can take over content like process steps or executables automatically and accelerate the design of your test case. In different sections you can design the content of your test case. General attributes such as Status, Priority or Owner can be maintained in the Header section. Here you also find options to define how the test case shall be executed (e.g., End-2-End Test Case or 4-Eye-Principle Execution). The detailed instructions how to execute the test are maintained in the Test Steps section. Furthermore, you can add attachments, leave working notes or navigate to related test cases via the template library. If you have any test cases available already in other 3rd party solutions or in files like Excel, you can also import them into Focused Build Test Steps. 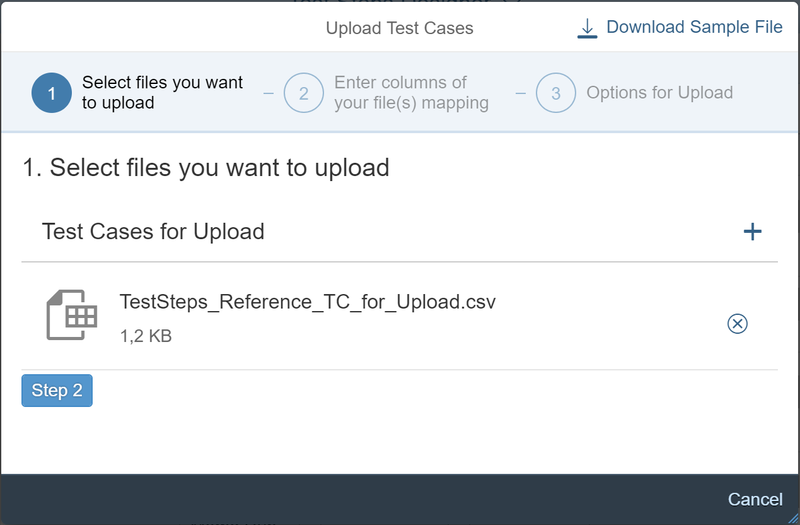 Either you make use of the upload feature within Test Steps Designer or you apply the Test Steps API for a custom specific import implementation. Test Steps allows you to design and execute multilingual test cases. There is no need to create separate test cases per language. You directly do the translation in the same test case and Testers can execute the test in their preferred language. With Focused Build Test Steps your Testers can easily navigate through the designed test case and record the test results. Features like direct transaction navigation, automated status aggregation, and input validation make testing intuitive and improve the documentation quality. The Focused Build – Test Suite Dashboard offers (among others) a detailed reporting on test execution results of manual tests. You get an immediate overview on relevant information like overall status, current step or number of defects. The results are summarized for the entire test plan including all test packages. With the drill-down navigation you can find more details like attached test results, defects or even actual results or evidence attachments for each step. With Focused Build – Test Steps, manual testing is simplified and accelerated. At the same time, you have the chance to increase your overall test documentation quality. Many features like content-driven test case design, guided test execution or in-depth reporting capabilities enable a testing experience which was not possible before in SAP Solution Manager. In this blog post I gave a first overview on the features & functions of Test Steps – and of course there is so much more to tell about: What about the different testing modes available during Test Execution? How can you request testers to document an evidence during execution? How to configure and switch on TBOM recording during test execution? What is the template library and how can you utilize this feature? I will continue on these and other topics in the next couple of weeks. Until then: I am happy to receive your feedback, questions or suggestions! Very practical and useful solution for the challenges of manual test cases. It is fantastic to see the result of many discussions and talks a couple of years ago. an evidence can already be recorded by uploading it directly to a step as attachment (e.g., a screenshot that shows the successful test result). Afterwards, in a role of a Test Manager or even during an audit you can review all test results including the recorded evidences in the central report for execution results of manual tests (see the chapter on Test Suite Dashboard above). Does this answer your question? There is no automated recording in that sense available. However, there is a TBOM recording function available which goes into a similar direction: during manual test execution you can record the “Technical Bill of Material”. This allows you to optimize test scoping afterwards comparing changes to technical objects and the actual objects which are part of a test execution. See function “BPCA” for further reading. I guess Alexandre was asking about a feature/capability to automatically capture screenshots during manual testing on SAP Solution Manager 7.2, which as far as I know does not exist. CBTA can automatically generate a report with screenshots, but this is only for automated testing and supported UI technologies. Few customers use a training tool instead, such as SAP EnableNow (former SAP WPB) or ANCILE uPerform. Otherwise, the evidence (e.g. word doc) can be uploaded manually, as you already know. I’m new in SAP world, is there a way to integrate this with for example test automation tools like Selenium? I have a framework written in java (selenium + maven + testng + jaxb) I would like for example to send a result of test to this tool. There is no integration with test automation tools available. This tool is for manual test execution only. SAP Solution Manager 7.2 can integrate with 3rd party test automation tools such as Micro Focus UFT (former HPE UFT), WorkSoft Certify and Tricentis Tosca. After performing the configuration to integrate SolMan to 3rd party tools, you can assign automated test cases to the Business Process Hierarchy in Solution Documentation/Process Management. When creating Test Plans and Test Packages in Test Suite, you can choose the required test cases. Additionally, Solution Manager provides CBTA (Component-Based Test Automation) tool to support SAP customer’s in optimise their testing process. For this integration and/or usage of CBTA you do not need Focused Build. On the other hand, Test Steps Designer is delivered with Focused Build. How could we trace the problems with the Test Suite performance of the Fiori screen just hanging? I am afraid I cannot help here. Please open an Incident on component SV-SMG-TWB. Thank you, this was completed few times – hopefully the Team will resolve this soon. Another question – which Security Role will allow to use the “Solman 7.2 Focused Build SP02 “Where Used List”, which is Greyed from the screen? Well Explained Tobias, Thank you!! I’ve a question to get it clarified. We have a requirement to create test steps for the GxP relevant test cases directly in Solman 7.2 for our specific business processes. I’ve done it for few(by copying steps from word document) but the test cases and test step counts are more. Is there a way to auto update/migrate/map our Test cases steps(*.docx or *.xlsx format) to SOLMAN 7.2 for auto creation of the steps in GxP relavant test case design? When coming from MS Excel / xlsx you should be able to convert it to CSV (UTF-8) and upload the test case afterwards via the upload wizard. Please note that you have to follow a certain structure within the CSV file. You find a sample file within the upload wizard. When coming from MS Word / docx you can use the API of Test Steps. First you need to implement a custom report which reads the docx file into a structured (ABAP) format and then you can create Test Steps test case using the API (see class /SALM/CL_TM_TS_TD_API). For mass upload a prerequisite would be that all your docx files follow the same structure / template. Otherwise you will have trouble interpreting the content of the files programmatically. Thanks Tobias. Good to know the options mentioned above. I used some formula for copying the content from word template to excel and then converted to CSV file. Its working in my way as well. After importing, I see the special characters used in test steps(CSV file) are not in the proper way. Do you have any hint. Please make sure that the latest version of the technical collective note for Focused Build is implemented. The CSV file should also be saved in UTF-8 format. If you still have issues please raise an Incident in SAP Support Portal for component SV-SMG-OST.